Angkor Thom is built in the late 11th century, covers almost 4 square miles and is enclosed by a 26ft high wall. This complex was actually the capitol of the ancient Khmer kingdom. Within its walls were the royal palace and residences for all the king's family, generals and priests. Its 5 monumental gates, each more than 65ft high, are dominated by 4 carved faces of the Buddhist Bidhisattva Avalokitesvara, facing north, south, east, and west... 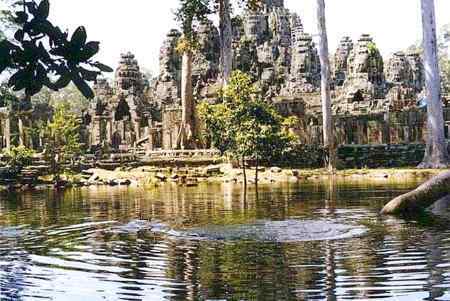 In the center of Angkor Thom is the temple called the Bayon. Built in its present form about 100 years after Angkor, this Buddhist temple is strikingly different. Its mountain-like structure is is topped by 54 towers, each sporting 4 faces like the city's entrance gates. Although it might sound repetitive, each of the faces is slightly different.